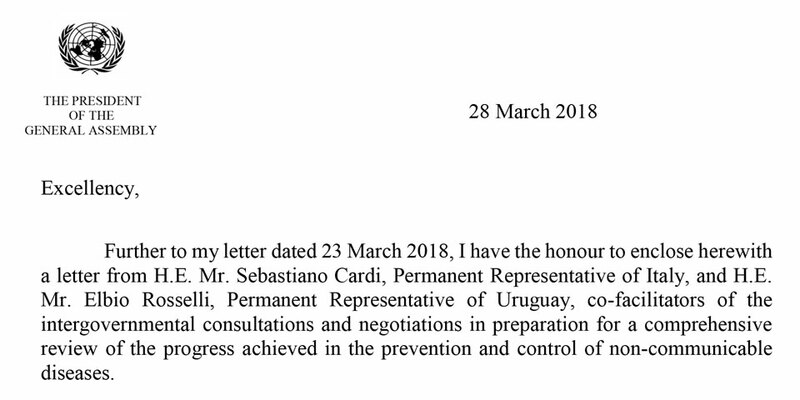 A ‘CARICOM CSO Statement on NCD Priorities’ aligned with the priorities of the wider CARICOM community of stakeholders will be arrived at through the Caribbean NCD Forum and presented at the anticipated UNHLM Civil Society Hearing and the 39th Annual CARICOM Heads Conference in July 2018. The Caribbean NCD Forum was attended by representatives of civil society, ministries of health and non-health ministries, public sector health partners and the private sector. During the course of the three-day event delegates assessed NCD response progress in the Caribbean; harmonize CARICOM priority areas for the UNHLM 2018; developed a communication strategy to encourage the highest level political attendance at the UNHLM and explore post-2018 strategies towards the achievement by Caribbean nations of the goals set out in the WHO Global Action Plan on NCDs and in the Sustainable Development Goals (SDGs). The World Diabetes Foundation (WDF) is dedicated to the prevention and care of diabetes and other NCDs in the developing world, and has as its primary aim to alleviate human suffering related to diabetes and its complications among the most vulnerable populations. For more than a decade the WDF has been supporting projects and programmes in the Caribbean, and project funding and technical support have been provided by WDF to a wide range of partners and stakeholders at both regional and national level, including ministries of health, diabetes associations and other civil society organisations, CARPHA, PAHO, and many others. It is with great excitement that WDF will support and co-host the Caribbean NCD Forum 2018 in Jamaica. 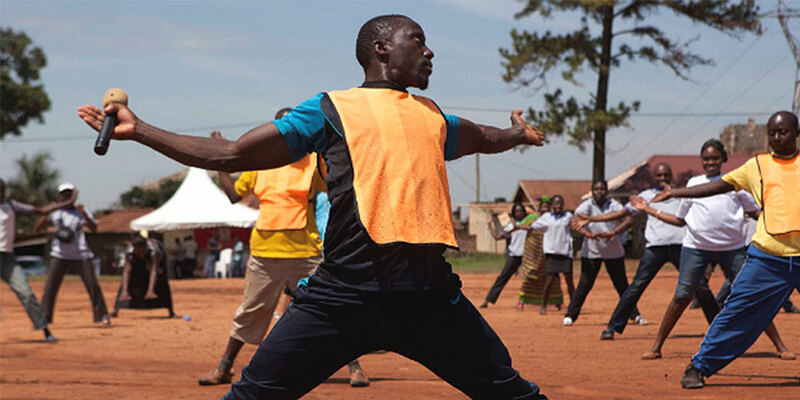 WDF has always believed strongly in civil society as essential in any meaningful response to diabetes and other NCDs, no matter where in the world. 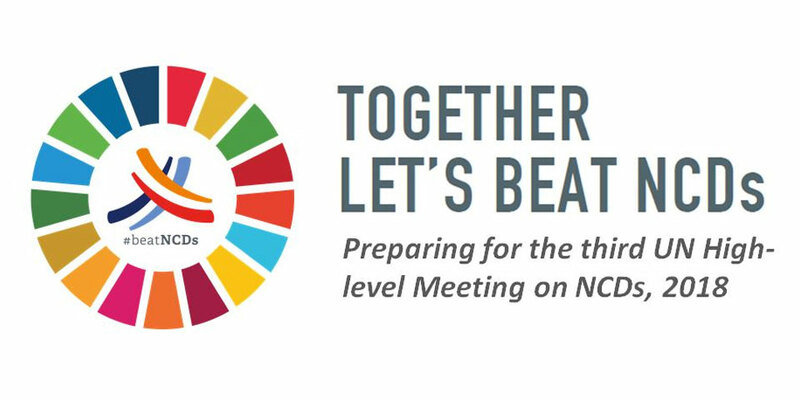 The global NCD movement started for real in the Caribbean with the Port of Spain declaration back in 2007 and we hope that civil society and leaders of the Caribbean once again will be at the forefront of the process, this time leading to the UN High Level Meeting. WDF remains a strong ally of the Caribbean in the fight against NCDs. The Caribbean NCD Forum represents a special and unique opportunity for Caribbean civil society to unite and meaningfully contribute to regional multisectoral dialogue and action in support of the highest level of CARICOM political participation at the 3rd UN HLM in 2018 – a meeting which will set the tone for accelerated national and global action on NCDs as we approach 2025 and 2030. The HCC welcomes this partnership with the WDF which has made this important regional forum a reality. 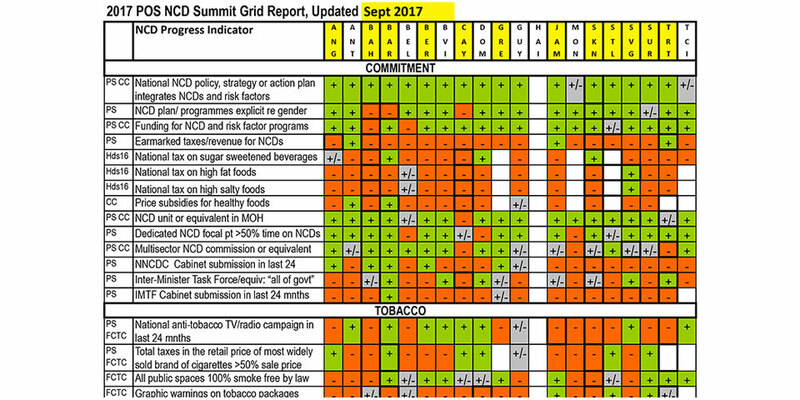 HCC Caribbean NCD Forum – Programme & Concept Note – Supporting National Advocacy in Lead up to the 2018 High Level Meeting on NCDs Towards 25*25 and the SDGs , April 23 – 25, 2018, Knutsford Court Hotel, Kingston, Jamaica. View/download. The complete playlist of videos for Day 1 can be accessed here Links to the videos of specific presentations and points of interest are available in the listing below along with pdf versions of the presentations. PANEL: Taking Stock - How have we performed? What has been achieved? The complete playlist of videos for Day 2 can be accessed here Links to the videos of specific presentations and points of interest are available in the listing below along with pdf versions of the presentations. The complete playlist of videos for Day 3 can be accessed here Links to the videos of specific presentations and points of interest are available in the listing below along with pdf versions of the presentations. Reflections on NCD prevention and control in the context of the 3rd UNHLM on NCDs - Sir George Alleyne. NCD prevention and control is important to me because..
it is all about living healthy and quality of life. your health is your wealth. If we do not take proper care of our bodies, this affects the quality of our life and the lives of those around us. Healthy bodies equate to healthy minds. I advocate for healthier lifestyles especially among our children because I feel very strongly that if we fail to urgently take control of this epidemic, it will continue to add to our national and regional health and economic bills. as a cardiologist I'm committed to promoting good heart health. it determines health, productivity and quality of life for all levels of society and the region and the international arena. two family members have been diagnosed as Diabetic and as such I am advocate for prevention of same as I have seen the impact that this illness has on individuals. we are all loaned one body in a lifetime- the least we can do is take care of it. As Caribbean people, our innate culture of "winging it" through health issues has resulted in a proliferation of NCDs, largely preventable, throughout the Region. We cannot continue to culture a lifestyle that glorifies alcohol & tobacco abuse; that pushes back on legislative intervention because of political agendas; that views childhood obesity & physical inactivity as the accepted status quo. We are better than that. Freedom of choice also means the freedom and diligence to make healthy lifestyle choices. the burden of chronic non-communicable diseases (NCDs) is regarded as a major public health challenge for countries worldwide and the Caribbean is no exception. With the Caribbean having the highest prevalence of NCDs in the Americas, the collective toll that NCDs take on our lives as Caribbean people is unimaginable but it is also preventable. As a health educator, my real passion is childhood obesity prevention. Our good and bad dietary habits start young and obesity has been shown to have negative health consequences proliferating NCDs in our children's lives and well into their adulthood. sustainable development can be defined as development that meets the needs of the present without compromising the ability of future generations to meet their own needs (Brundtland Report). The major NCDs are overwhelmingly the leading causes of illness and death in the Caribbean often resulting in catastrophic costs at the household level as well as unsustainable healthcare costs and expenditure. 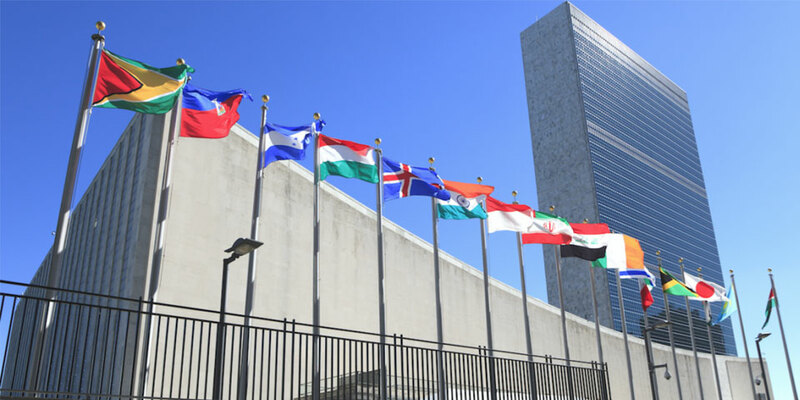 They are, therefore, a palpable threat to the sustainable development of the entire Caribbean. NCD prevention and control is a matter of survival for the entire region. the high prevalence of obesity and related non-communicable diseases continues to impact the health of Caribbean populations. However, the socio-cultural diversity of the islands, and the pervasiveness of unhealthy diets and sedentary behaviours make single-target interventions a challenge. Given existing constraints on resources, it is crucial that efforts are made to improve awareness and build capacity. 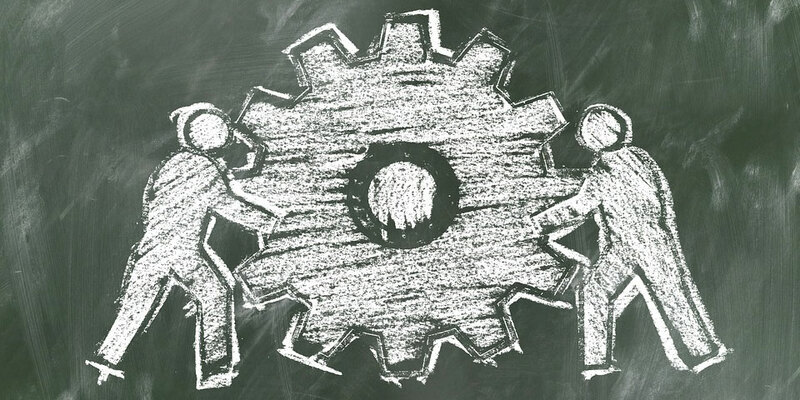 Any attempts at developing interventions must take an evidence-based, multi-level approach and involve professionals who are suitably trained. this is the major cause of premature death and morbidity worldwide. The negative consequences of NCDs lead to depletion of already limited resources in many countries which only adds to the economic burden and subsequently very ill populations which stifles growth worldwide. I have lost a parent and many family members to Hypertension and Cancer. It is of utmost importance as Cancer is an NCD and shares the same risk factors leading to disease mortality and morbidity. In fulfilling my job i come into contact with children and adults on a daily basis affected by Cancer and other NCDs most of which could have been prevented thru lifestyle changes and understanding of the attributable risk factors . The rise in NCD in a Caribbean problem and need to be mitigated via prevention and control education. with several family members with NCDs including hypertension and diabetes and my beloved grandfather passing prematurely from a chronic illness that was easily treated, it impacts me personally. Professionally in my practice I see small children who are obese and some have developed hypertension. The fact that this is preventable with patient and child education and that we can reverse this concerning trend towards worsening obesity including child obesity, premature development of NCDs and early death, if it’s within our capacity to help make change then we have to do so. NCDs are limiting the full potential of children and adults, reducing their life expectancy and quality of life, as well as eroding budgets and spending capacity of individuals, families and the state. Moreover it is adding more burden to the already over-burdened health system. We therefore need to curtail and reverse the NCDs and their effect. We need to empower everyone, especially women of reproductive age and the young. it can extend the productive lifespan of over 70% of Caribbean people and in so doing make an enormous economic and public health contribution to our respective countries. Further, it can free up billions of dollars spent on treating NCDs which can be used for other health and social services. At the individual level it can remove the physical, financial and psychological damage within families affected. several members of my own family have been diagnosed with the at least one NCD. Just recently, a good friend of mine who struggled with diabetes, succumbed to a heart attack at the young age of 32. I aim to equip myself with the knowledge to help others appreciate how NCD prevention and control can play a critical role in their lives. the burden of disease affecting us is overwhelming. When this scenario is coupled with a complete lack of the necessary human and infrastructure resources needed to manage it, we find ourselves on a one way road to a major catastrophe. NCD prevention and control is the key to avoiding social and economic collapse in our developing states. because the epidemic threatens our Health, Economies, and our very sustainability. NCDs touch the lives of each person, without discrimination. I'm passionate cultivating healthy lifestyles, particularly in ways that are sensitive to the contexts in which we live, the challenges that confront persons on a day to basis, and in a manner that respects the diversity between and within populations. Each of us contributes to the whole, and our daily efforts in our personal lives and beyond have ripple effects. responses to HIV and NCDs must be integrated to achieve the SDG targets relating to health and wellbeing. 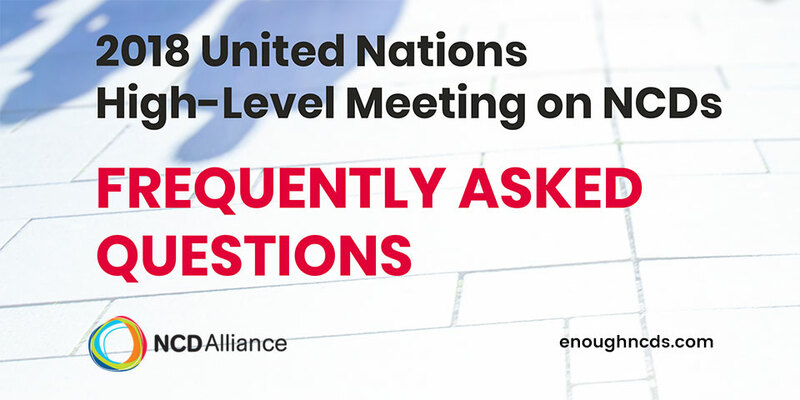 18 Dutch- and English-speaking countries and territories across the Caribbean have identified as a major issue for joint work with the United Nations over the period 2017-2021.
premature deaths from NCDs is one of the major challenges in the twenty first century. 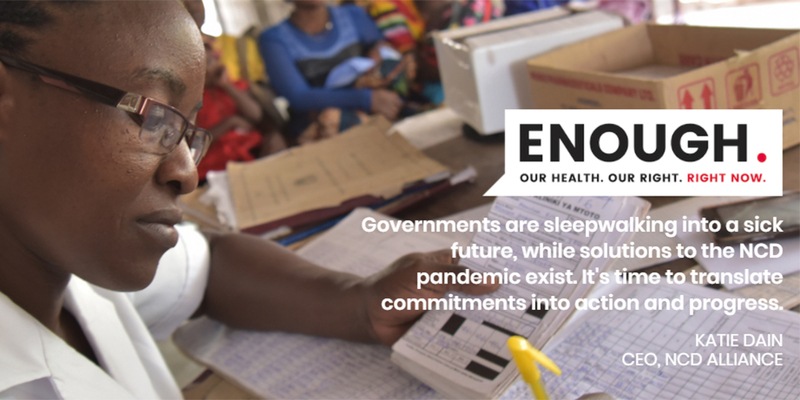 We have feasible and cost-effective interventions to prevent them, but we need to work together and act now. NCDs place a significant burden on our health system and affects the health, quality of life and families of many individuals. Left unchecked, and its current trends of being responsible for 8 out of every 10 deaths and 73% of preventable premature deaths, NCDs have the capacity to cripple our health system, make efforts at UHC unsustainable and destabilize our economy. The efforts of the Region in our response needs to be are urgent as it would have in the face of an impending natural disaster. NCD prevention and control must be embraced as the approach for mitigating against the risks. Noncommunicable diseases (NCDs) are the leading causes of death worldwide; more people die from NCDs than from all other causes combined. As a nurse with 37 years of experience, working with persons and family affected from noncommunicable diseases and has witnessed the frequent hospitalizations due to uncontrolled situations, complications, such as amputations which often results in disabilities and in some cases deaths. These negative instances have left me with great concerns, which have had a great impact on my life. and a passion to work and fight for the prevention and control of NCDs. NCD's are the leading cause of morbidity and mortality in our region. In addition to the health impact, there are also economic and national development consequences of this epidemic. Prevention and control is therefore imperative. it is important to the health and well being of our people as well as redound to the level productivity of our country. as a Public Health Professional I consider it important that I be involved in the efforts to reduce the conditions that are responsible for the largest number of premature deaths and that negatively impact the wellbeing and development of the people of our Region. many of the people I love around me have or had chronic diseases. My husband has hypertension and dyslipidemia, my Dad past away from colon and liver cancer, my Mom died of Parkinsons, my younger sister had breast cancer, my oldest son is now on hypertension medication. I only got to know one of my grandparents. Three died of heart ailments. I certainly cannot seat idly. We do have to do more and be more effective to reduce chronic diseases. I want to do what I can. NCDs not only negatively impact on individuals' physical health but also on their mental and social well being and that of significant others. Workplace and family responsibilities and relationships, community involvement and the very quality of life are also affected. The good news – NCDs have common modifiable risk factors which can be addressed through a multi-sectoral approach. I have been involved directly in NCD Prevention and Control efforts in Barbados and the Eastern Caribbean for over 10 years. Much has been achieved but even more is yet to be done! as a person now living with diabetes for over 26 years, I frequently say to my family and friends, If I knew then what I know now, I probably would not have developed diabetes or would have delayed the onset. 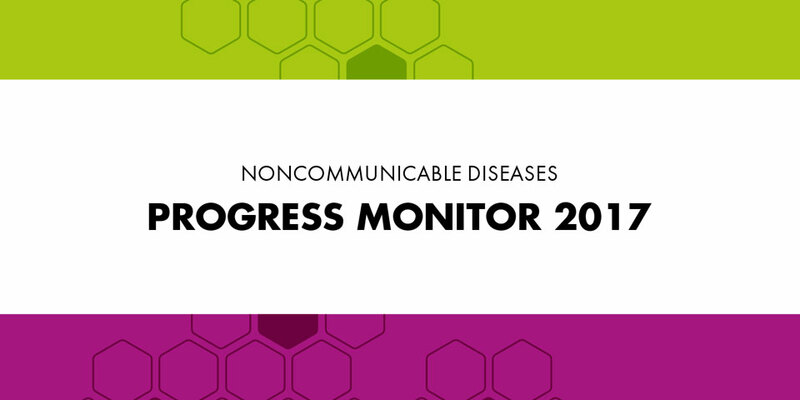 As is evident, Non communicable diseases (NCD) are on the rise globally, including Belize. While the government and the medical personnel are doing its best to stem this rise, there is a lot that the individual can do for him/herself. For me, education is the key. While government can continue to provide avenues for healthy living, the individual needs to be proactive in making proper choices in their daily lives. obesity is a global epidemic and a major risk factor linked to the growing burden of NCDs, Cardiovascular disease, diabetes and cancer. 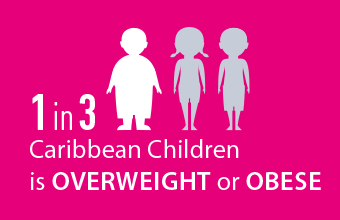 Overweight and obesity in children is increasing in Jamaica. This disturbing health trend has to be curbed as the health and economic impact on Jamaica and other small island states will impact the growth and development of these countries. We as a community must inform, educate and begin being advocates for policy and behaviour changes across the Caribbean to save this upcoming generation. NCDs causes a great burden to the population and has become a threat to national economic stability and a social burden on families. This should not be our reality since NCDs and their risk factors can be successfully prevented and controlled. Food security: Enhance food security. Encourage increased production and consumption of regionally produced food, especially fruits and vegetables. Develop nutrition sensitive food and agriculture policies. Healthy eating: Support elimination of trans-fat from Region’s food supply; reduction of salt and sugar intake. as a healthcare provider the NCDs are a great source or morbidity, mortality and economic drain to our small islands and struggling economies. My aim is to help people live happier, healthier lives both physically and mentally and the assist with equipping persons with the knowledge and tools to do this. 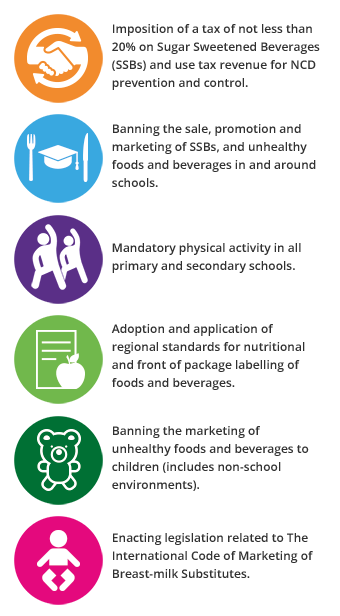 health is essential to ensure quality of life for children, adults and seniors but, additionally, a healthy population is fundamental to ensure a capable workforce and a future capacity. NCD prevention and control is important to me in that it is fundamental to Bermuda's prosperity. because it is less costly (financially and timely) than treatment and complications. It will costing health systems, countries and globally to reduce this burden in the future. It is time to start acting – everybody. By just knowing and doing the right lifestyle changes such as healthy eating and physical activities we need not worry about NCDs much and will avoid complications. in a personal capacity, there is a strong family history of hypertension and diabetes and I am familiar with all the consequences of these diseases. As a former Ob/Gyn, I am aware of the effect of the NCDs on perinatal mortality and the need for prevention and control in order to have an impact in the reduction of this stat. it is important to everyone. NCDs lead as some of the most popular causes of preventable death and it seems, we have the answer. having worked in a hospital setting for almost 20 years I have sen first hand the complications associated with NCDs. However I have also witnessed positive health outcomes. I believe that more can be done to prevent and control NCDs and I think a more supportive environment is critical to achieve improvements in prevention and control. We can all do our part individually and collectively to reduce the pain and suffering and the high costs of treating NCDs and their complications. We all want to enjoy a good quality of life and a long healthy life and to see our countries develop. Cancer shares risk factors with other NCDs that are relevant to cancer prevention and control. NCD prevention and control model is done holistically to facilitate an all of society approach. Additionally, NCDs are leading causes of mortality and morbidity in Belize and other countries affecting health, wellbeing, quality of life and economic prosperity of our people. 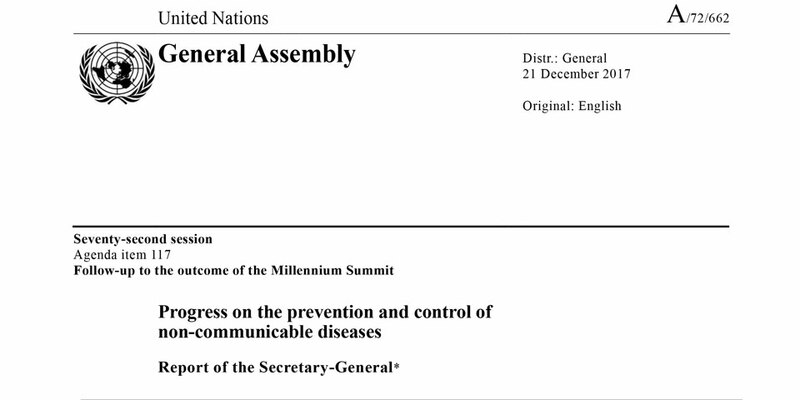 Non-communicable Diseases (NCDs) are recognised impediments to sustainable development globally. More than 40 million (mn) people die annually from NCDs (70% of global deaths), including 17 mn people who die prematurely before the age of 70 years. Poor health is an antecedent to poverty. Indeed, almost 90% of premature deaths from NCDs occur in low and middle-income countries. Deaths are linked to common risk factors, such as tobacco use, unhealthy diet, physical inactivity and harmful use of alcohol. the incidence and prevalence of NCDs continue to be a major source of concern. NCDs are seemingly destined to roll back the strides that health systems have made over the years; even more critically, they threaten the development project of the region. Against this backdrop, it is the responsibility of all to advocate, advise, educate and agitate if necessary, in the corridors of decision-making. In this undertaking, a deepening of the partnership among stakeholders, communities, households and governments is imperative. these disorders represent the major cause of death and disability in the Caribbean there by affecting our productivity. I represent the World Diabetes Foundation which has as its mission to support diabetes care and prevention in low- and middle income countries worldwide. Our vision is to alleviate human suffering from diabetes and its complications. NCDs have an extremely negative impact on our population's health. It impacts the economy of the countries in the region through the climbing cost of health care and also reduces the productivity in our businesses. In our industry we witness the impact financially and emotionally every day. I have also experienced the impact on my own family and I believe we must all work together to positively influence lifestyle change in the region in order to significantly reduce the negative impact across the region. it accounts for significant ill-health and death worldwide, regionally and nationally resulting in much pain and suffering and much economic hardship. 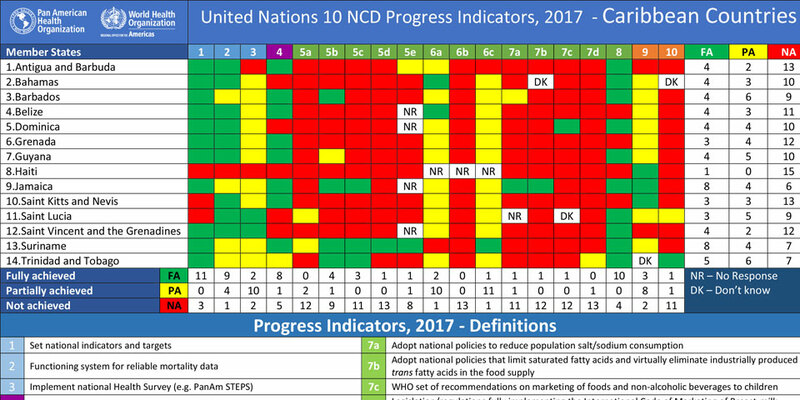 NCDs occur as a result of misguided priorities and indicators of progress fuelled by a world economic system that favors those "that have at the expense of those that have not". An unjust world one that I am keen on playing a small part in making more just by contributing through action in NCD prevention and control. the global epidemic of NCDs is widely acknowledged as a major development challenge in the 21st century, and a significant threat to achieving internationally agreed development goals. In addition to being the leading causes of death, NCDs impose years of disability on those affected and their families. 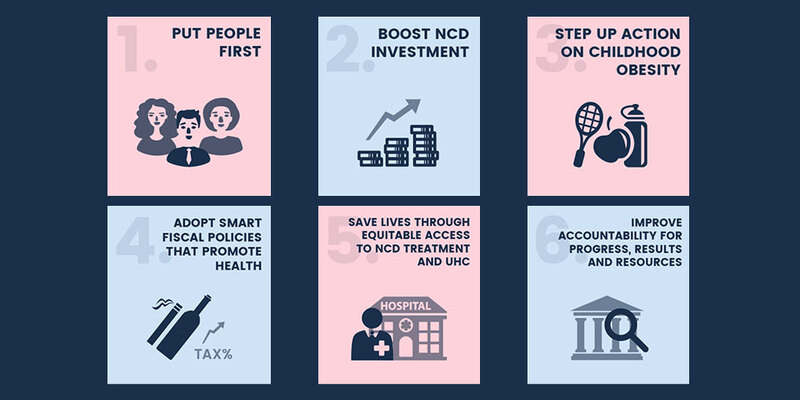 Improving the health of populations, including preventing and controlling NCDs, is integral to ensuring progress across the three pillars of economic growth, social equity, and environmental protection—with the ultimate goal of achieving sustainable development. NCD prevention is at the core of our clinical programs, which includes quality health care and free drug therapy for 120 patients, support groups at community level that provide counselling and orientation to almost 140 persons, and a project funded by the WDF where 165 primary health care units will be improved on prevention and service delivery for Diabetes and Hypertension. 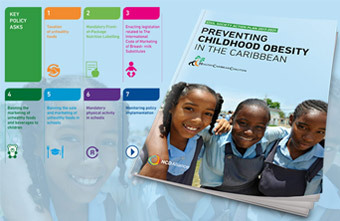 The HCC and our 100+ CARICOM members are calling on Heads of Government to enact the following policies and legislation to combat childhood overweight and obesity. Childhood obesity is linked to complications in childhood such as diabetes and hypertension and it tracks into adulthood increasing the risk of developing NCDs (diabetes, cancers, and heart disease).